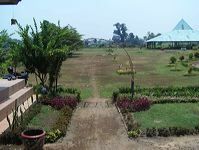 Gentong Temple is located in Trowulan village, Tromulan district, Mojokerto regency. 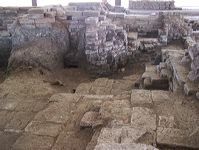 This site is consisting of two temple buildings that made of red brick. Both of those temples are built in a row to north – south direction, about 25 meters to west direction. The temple that situated in south side called Gentong Temple I, and which situated in north direction called Gentong Temple II. The borders of Gentong Temple has not known yet, but based on the ancient tools that had found, it can said that this temple was a wide temple complex. Verbeek in TBG XXXIII 1889 wrote the first information about Gentong Temple. In this book Verbeek said that in the year, Gentong Temple’s form could be recognition. But Verbeek didn’t explain it in detail about this temple’s form. Knebel in ROC 1907 said that Gentong temple was just small heap of soil. Krom in his book Inleiding tot de Hindoe Javaaneschhe Kunst in 1923 said that Gentong Temple is situated not far from Brahu Temple. This interesting information is gotten from Ir. Henri Maclaine Pont’s note. In his research of reconstruction of Mojopahit Kingdom’s City, Maclaine Pont said the three temples that in line to west – east, that is Gentong Temple, Tengah Temple and Gedong Temple. It has not known yet about the third temples if those are the temples that situated in Gentong temple site or in the other temple site, compared with the temple lines that different from the other that mentioned in Maclaine Pont note and the present condition. Gentong Temple I and Gentong Temple II when it had found, the condition was bad, just ruins left and the original form is shown by its legs. Gentong Temple I map that can be seen completely showed its form is rectangular. Seen from its map, Gentong Temple I is a building that has a central room. While Gentong Temple II show map of central building, that surrounded by the other small buildings. Seen from its size, Gentong Temple I is bigger than Gentong Temple II. Based on research that has been done, it is said that Gentong Temple has Budha religion background. This is proved from all things that has found around those temples. The protection of Gentong temple site has begun in 1986, with research study about ancients building in Trowulan in arranged the Plan of Main Archeology Ex Mojopahit City. 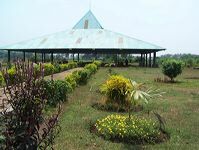 From the research, there is no meant things that can be inform about this temple, it is because many of this temple’s structure were covered by soil and grass. This activity then continued by Project of Historical Inheritance Management And Archaeological of Ex Mojopahit City, with the technical study in 1994/1995. When it had done, the real form if the temple, was not found yet. Because of that, it is conclude that need to have a conservation of all area around Gentong temple. This plan has done with the reparation activity in 1995/1996 and continued till 2001. 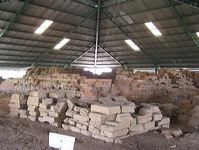 During six years the reparation show the structure of Gentong Temple I and II, and thee roof made to protect new structure. This reparation is end with environment arrangement in 2004.